The Supermicro X10SDV-4C+-TP4F is a is a low power platform that can serve as a great foundation for storage and networking appliances. It has an onboard Intel Xeon D-1518 which is a four core, eight thread Broadwell-DE based SoC which we previously benchmarked in-depth. The X10SDV-4C+-TP4F utilizes Supermicro’s FlexATX form factor which affords greater expansion possibilities and SFP+ networking than Supermicro’s mITX form factor. We used a similar configuration to our other Xeon D reviews. At around $470 new, our configuration is a bit higher-end than many will pair with this motherboard. For those building a networking node, the add-in card will likely be focused on an add-on NIC. For Ceph nodes one will likely use a mSATA boot drive, four SATA hard drives and a m.2 SSD for caching. 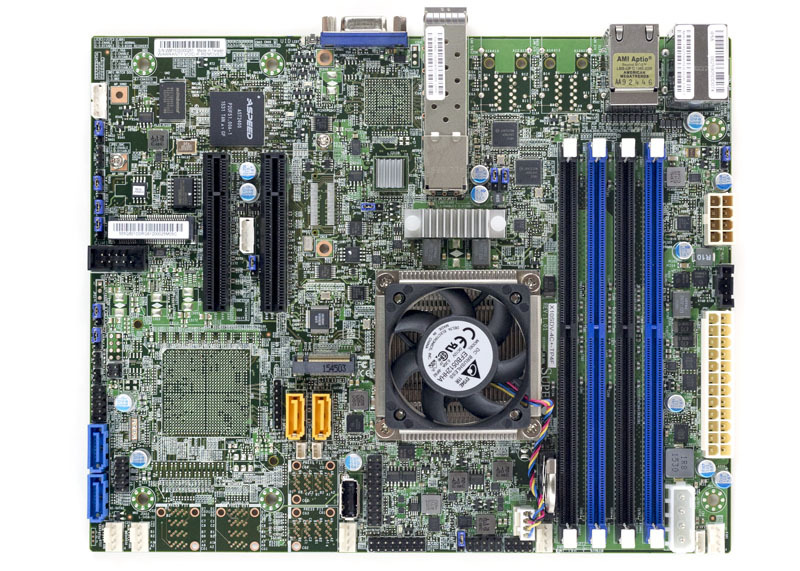 The Supermicro Supermicro X10SDV-4C+-TP4F is a FlexATX motherboard. This size allows the motherboard to fit into short depth chassis and still allow room for cooling fans. 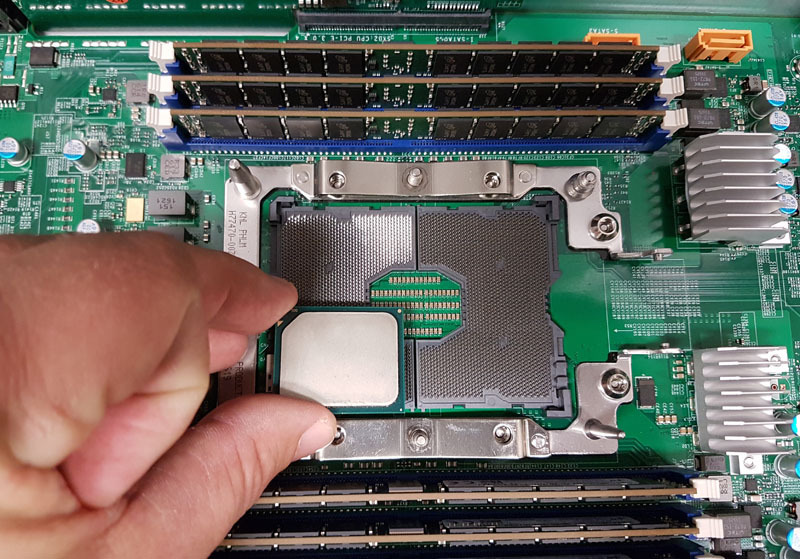 The onboard Intel Xeon D-1518 has 4 cores, and 8 threads thanks to Hyper-Threading. TDP is spec’d at 35W. 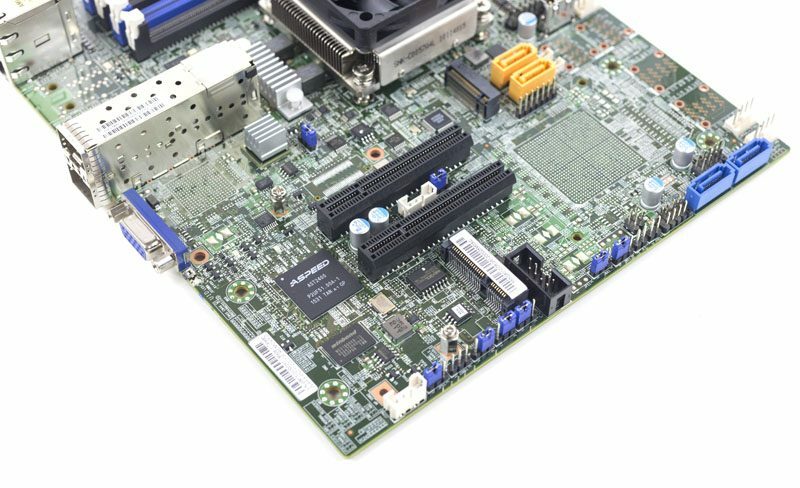 Like Supermicro’s other X10SDV FlexATX motherboards, the X10SDV-4C+-TP4F motherboard follows front to back airflow. The “+” in the model name denotes that the processor is actively cooled. You will need chassis fans to cool the CPU and other components. With six 4-pin PWM headers (one occupied by the CPU fan) there is ample room to add cooling fans as necessary. In terms of expansion, there is a m.2 PCIe SSD slot that sits above the two PCIe 3.0 x8 slots. When selecting a 1U rackmount chassis, the two PCIe slots allow for flexibility regarding where the 1U riser is used. This makes the FlexATX’s PCIe design compatible with more rackmount chassis than the mITX design. 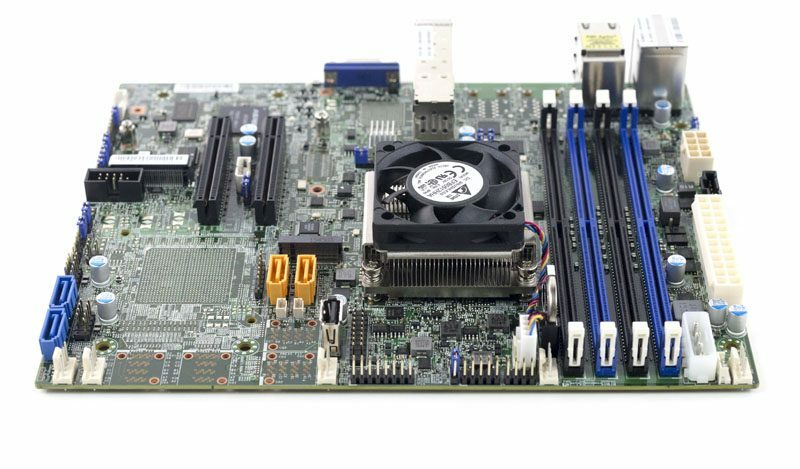 We have used Supermicro SC505 and SC504 chassis with success and even older chassis like the Supermicro SC113. One can also see the mPCIe/ mSATA slot below the PCIe slots. The mPCIe/ mSATA slot is useful to install a boot device into the platform or a low profile SSD. There are four SATA ports onboard. The two yellow/ orange ports support SATA DOM power and there is also a SATA DOM power connector just next to each port. We use SATA DOMs on the Supermicro X10SDV motherboards we use to host STH. The Supermicro SATA DOMs we use do not require the additional power cable and are instead powered by the orange ports. In storage configurations these four ports will often be used for hard drives with the m.2 and mPCIe/ mSATA ports being used for SSDs. Next to the SATA DOM ports there is an internal USB Type-A header that can also be used to host a boot device. For example, with VMware and Nutanix builds, a USB key is often used as boot media or as a licensing mechanism. The rear I/O includes four primary networking ports. Dual Intel i210-at Ethernet controllers provide 1GbE connectivity and are out of the box compatible with just about every major operating system. The other network ports are two SFP+ 10GbE ports that utilize the Xeon D onboard 10Gb MAC. With the latest OS versions (e.g. Ubuntu 16.04), this works great because the Broadwell-DE Intel X552/ X557 drivers are included. If you are using older OS versions you will likely need to load the latest Intel ixgbe drivers. Rounding out the rear I/O there is an out of band management Ethernet port. One can also see a VGA output and dual USB 3.0 ports for local KVM access. 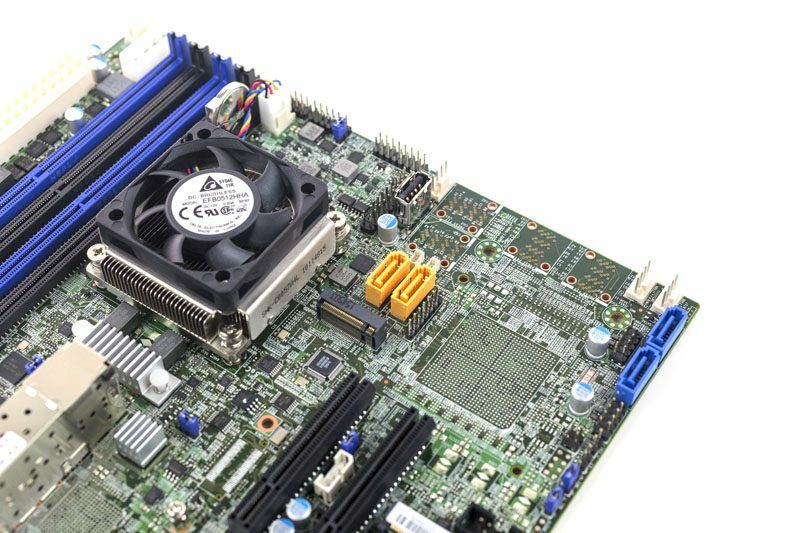 Now having tested/ purchased a total of over 20 of these motherboards, we have only needed to plug in a VGA monitor to one board. That was just to triple check we were going to be upgrading the correct unit in production. 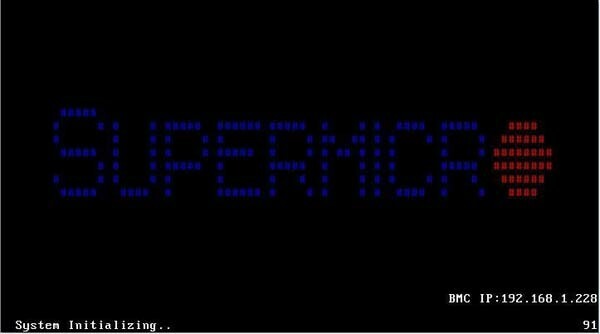 Most management will be done via Supermicro’s remote management feature. 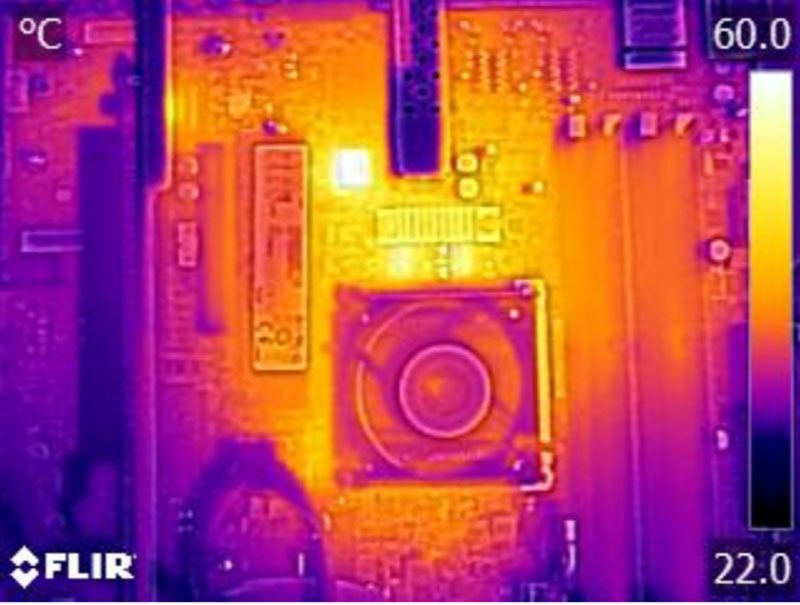 Overall, the thermal performance of the setup was good. The power deliver components on our unit did get hot but were within spec and we did not notice any stability issues with the platform. We did not have the m.2 SSD stressed during this test. If you do have an m.2 PCIe SSD installed, you will want to use the 4-pin PWM fan headers to provide chassis cooling to that side of the motherboard. For those looking to build networking appliances or lower-end storage appliances, the Supermicro X10SDV-4C+-TP4F is worth consideration. 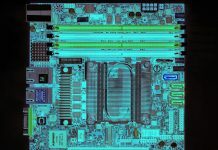 The Intel Xeon D-1518 SoC provides a good balance of low power operation yet with solid performance. Integrated boot drive headers (e.g. USB Type-A, SATA DOM and mSATA) mean that there is ample flexibility with the platform to either remain compact or provide mass storage. 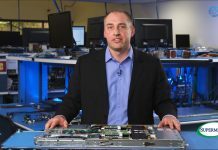 The ability to run up to 128GB DDR4-2133 means that running lightweight virtualized workloads runs well on the platform.